Wetlands are often misunderstood because we usually think of them as a “swamp,” often in movies it is where the bodies are found. At one time everything was a “swamp,” not a place to go for a holiday or spend some quality time. We are now learning wetlands are important but we still don’t know much about bogs, fens, swamps and ponds. And its ecological perceptions are changing. But wetlands that include swamps, bogs, fens and ponds are of the highest ecological importance. It is an area where our ecological perceptions are changing. Ecologically speaking wetlands are areas where water covers the soil or is present either at or near the surface of the soil all year or for varying periods of time during the year, including during the growing season. Water saturation largely determines how the soil develops and the types of plant and animal communities living in and on the soil. The prolonged presence of water creates conditions that favor the growth of specially adapted plants and promote the development of characteristic wetlands soils. Marshes and swamps are one of the broadest categories of wetlands and in general harbour the greatest biological diversity and account for almost half of all wetlands throughout the world. And one of the best is in our back yard. The wonders of Mashkinonje are best known by field naturalists from North Bay and Sudbury; university botany students and nature-based tourists. Mashkinonje Provincial Park was created in 1963 and is a non-operating park; it is administered by Killarney Provincial Park. 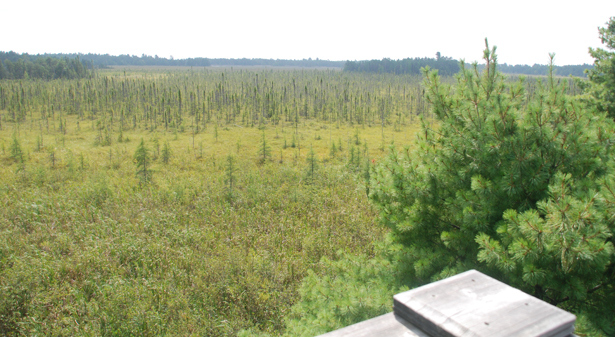 It consists of a diverse system of wetlands supporting all the major wetland types; marshes, bogs, swamps, fens and ponds; interspersed with undulating granite ridges that cover over 2000 hectares along the West Arm of Lake Nipissing. 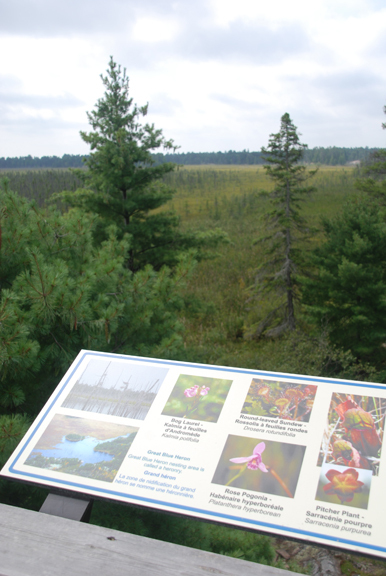 The park counts among its many wetlands two provincially significant areas the Loudon Basin Peatlands and the Muskrat Creek complexes. Its features are diverse, the result of a post-glacial lake that covered the area combined with a series of parallel low elevation folded bedrock uplands. The low upland bedrock areas were wave washed with soils eroded and deposited in the depressions. The amount of soil deposited determines if the depressions are nutrient rich or nutrient poor. The broken drainage also has a range of moisture levels from wet to dry. Add to moisture and nutrient variability- wave action on Lake Nipissing and aspect (south vs. north facing slopes) and the result are a variety of wetlands habitats that make Mashkinonje a very interesting location to observe nature. A combined group of community and educational partners – Friends of Mashkinonje (www.mashkinonje.com) have developed a system of hiking trails in the park to make the park features available to the public. Recently Ontario Nature (ON) held a retreat in the area and Back Roads Bill attended. Founded in 1931, the organization works to connect people with nature, through research, conservation campaigns and public engagement. 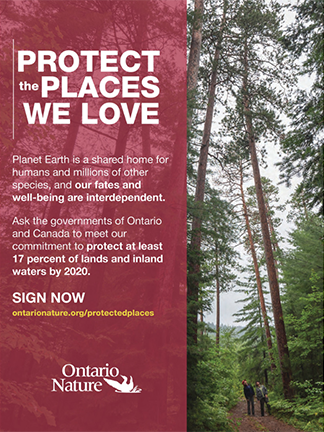 From spearheading the creation of a wilderness area in Algonquin Park in 1934 to working tirelessly for the creation of the Oak Ridges Moraine Conservation Plan in 2001; publishing science-based research for scholars and education materials for young naturalists; advocating for Ontario’s original Endangered Species Act in 1971 to pushing for its timely revision in 2007, ON has been at the forefront of the conservation movement in this province. ON’s voice is sustained by a nature network of more than 150 member organizations and 30,000 members and supporters. Angela Martin is the past President of Ontario Nature and a long-time resident and a former lodge owner in the West Nipissing area. “I am a nurturer combined with a perfectionist. I care about doing things the best I can and diligent in my efforts. I appreciate nature’s beauty, diversity and what it gives me and in return, I nurture the nature around me. These traits have led me to get involved with nature related organizations. She joined the Nipissing Naturalists Club in North Bay. I found people who shared similar values.” This resulted in being asked to join their Board of Directors and she became their president for eight years. “The Club did well and we produced a book Species at Risk in the Lake Nipissing Watershed. 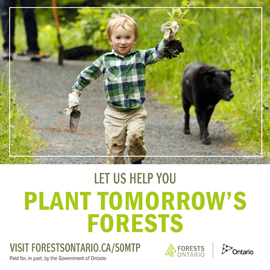 This raised the visibility of what was occurring in our environment and was copied by other organizations in Ontario. She is part of a dedicated community of volunteers who created the park’s network of trails. She said, “We recognize the values of this park.” The park was identified by the John Robart’s government of 1963, the park was expanded by the Mike Harris’ ‘Living Legacy’ in program in 1997. Originally it was named Haddo Provincial Park on some older topographic maps. She explained a steering committee was formed in 1997 and then the Friends’ group in 2000. Dr. Peter Beckett lead an interpretative plant hike, he is a Laurentian University biologist, one of the pioneers of Sudbury’s “re greening” restoration efforts and a member of the Friends. The Loudon Peatland Trail is Back Roads Bill’s choice because of the lookout tower but there are plenty of trails to tackle on other days. On the west side of Highway 64 there are ten stacked loops totalling more than 35 km on both sides of Highway 64. 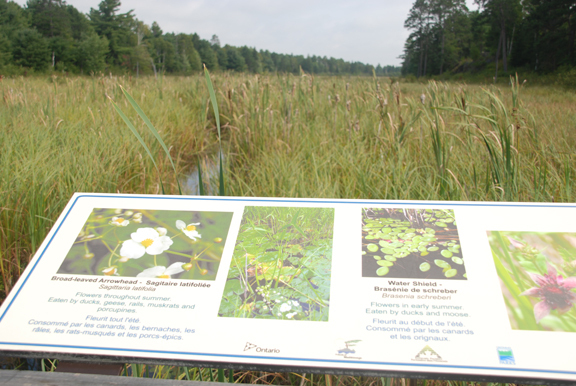 Thirty-eight percent of the park is wetland and there are “many little bridges” and board walks totalling more than one kilometre of construction. 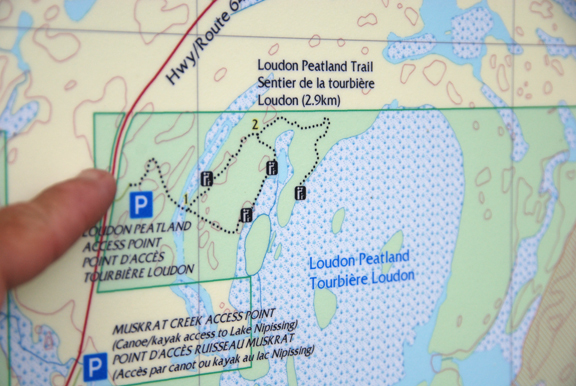 Looking for a day trip, you can also launch your canoe or kayak at an access point just south of the Loudon Peatland trail and experience the Muskrat Creek leading to a more remote part of the West Bay of Lake Nipissing. The east access is 2.4 km north of the Blanding Access Pt., about 100 metres off of the highway. Then there is the West Arm extension to the west of Highway 64, there is a roadside picnic area to launch from just south of the bridge. Travel west from North Bay, through Sturgeon Falls on Highway 17 to Verner, turn south on Highway 64 (stop in Verner to read the historic plaque – Reverend Charles Paradis – “the rebel priest.”). Lavigne is 13 km from Verner on the Northwest Bay of Lake Nipissing; an expansive view to the east. Journey fifteen more kilometres to the Loudon Peatland Trail on the east side of the highway. Access to the west network of trails is via the Blandings Access Point, just north of the Chemin Samoset Rd. and just 0.9 km south of Memquisit Rd. Access to the north section of the loops is via Musky Island Rd. It is one of the few trails to have a designated snowshoe symbol, welcoming the winter pastime (sorry eh?). The lookout tower is located at WGS 84 17 T E 554576 N 5123255 or N46° 15’ 38.5” W80° 17’ 30.6”. It is a very unique view and vantage point to see the extent of the peatland. We all have seen a pond or swamp of some description. Wetlands matter, go and have a look at the diversity of Mashinonje which nature gives us at only, the cost of the time, we need to spend. We should come to know them like some of our familiar coniferous and deciduous trees (the fall colour change is upon us). 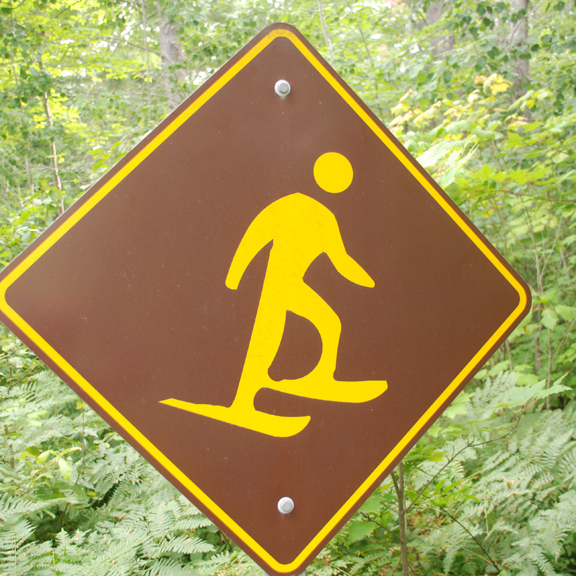 And the trail system has a welcoming snowshoe icon, denoting its multiple use. Contact the author at wilstonsteer@gmail.com or visit www.steerto.com.